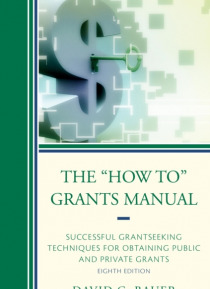 This book breaks down the sometimes overwhelming and difficult task of creating a successful grant winning proposal into a series of clear and definable steps that lead to grant success. The implementation of these pro-active grant steps results in government, foundation and corporate grants success.Whether you are with a non-profit organization, a school district, or an institution of higher educ… ation, this step-by-step process will demystify the grants process and help you become a confident and knowledgeable grantseeker.Researching the grantor, reviewing previously funded proposals, and making pre-proposal contact with the funding source are just a few of the pro-active steps that will help to assure you that what you propose is right for the grantor and that the grantor should therefore select you to fund.The exhibits/worksheets in The ';How To' Grants Manual further support this successful system.If your organization or institution wants to increase your success in attracting grants, this book if for you. From operating grants to technology to research, this book will help you outline your plan for success.